As I've mentioned here before, the true measure of any portrayal of Dr. J. Allen Hynek's groundbreaking UFO research comes down to one question: "Would Dr. Hynek be proud of this?" Take a good look at the photo below. Did this ever happen to Dr. J. Allen Hynek in real life? The answer is no. Dr. Hynek never found himself in a dark government lab, staring at an alien "grey" floating in a tank. Not even once. 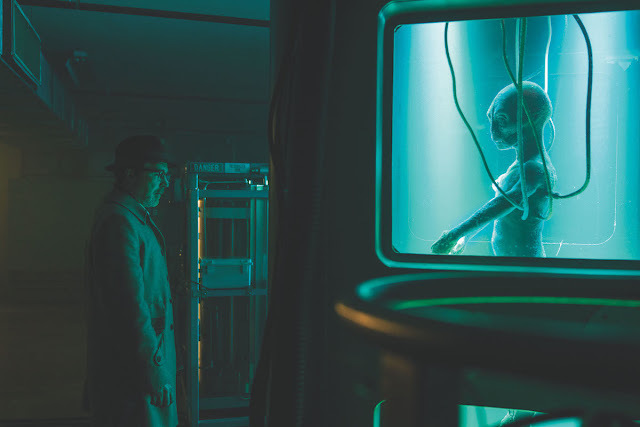 But, this is how the producers of Blue Book have decided to "jazz up" the true story of Dr. Hynek's UFO work with the Air Force. "We were pretty good about sticking with history," declares the show's creator in the SYFY.com article. Oh, okay, that's reassuring. Because when I saw this picture of Hynek meeting an alien, I thought maybe they had been pretty bad about sticking with history. Nice to know I was wrong! I bet Dr. Hynek would be proud as heck.